Advertorial by Infraware: The opinions expressed in this story may not reflect the positions of PhoneArena! 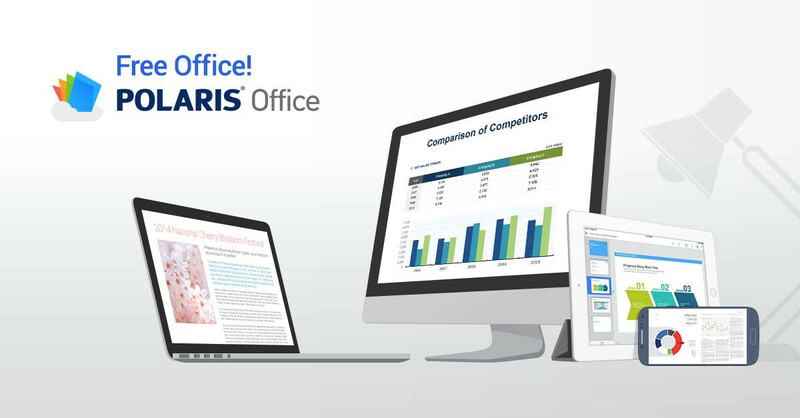 POLARIS Office has recently completely overhauled its popular PC-level Office suite for Android and iOS, introducing a clean and modern looking new interface and - best of all - slashing its price to zero. Unlike Microsoft’s official office application, POLARIS Office offers both viewing and editing documents for free (Office requires you to pay in order to be able to edit files). You are also not limited in any way when it comes to editing - all 500 editing features and over 170 shapes are available in the mobile version of POLARIS Office, so you have freedom of editing that was usually preserved only for desktop users. In addition, POLARIS Office is the only office package that supports more than one way to access your documents in the cloud. You know that Microsoft Office supports only One Drive cloud integration, and Quickoffice supports Google Drive, but only POLARIS Office supports multiple cloud services including Dropbox, Google Drive, Box, WebDAV, uCloud, and more. In contrast with Apple's iWork suite that is limited to only one platform (iOS), POLARIS Office is truly cross-platform and is suitable for those who use multiple devices or cloud services. Not just that, but POLARIS Office also uses its own, reliable cloud storage. It’s also worth noting that POLARIS Office is user-friendly, providing consistent and timely updates, and taking customer feedback into account. Its rich language support is an illustration of that principle. In addition to English, it also supports Chinese, Spanish, French, German, Russian, etc. While all of this rich functionality is free, you can expand on it even more by opting for the affordable subscription service. The premium POLARIS Office service provides 5GB of cloud storage for your documents (up from the 100MB of cloud storage offered for free) and will allow you to sync up to 5 devices (the free version is limited to 2 devices), as well as password-protect files. With all these options, POLARIS Office ranks among the most functional office suites for mobile. Feel free to check it out and download it at the link below. i have polaris on my galaxy note 10.1 (comes free on galaxy devices b4 its price gets slashed to zero). It has more features than the offical MS office but i must say it's horrible. All the files get displayed wrongly and when creating or editing docs, either they become incompatible with the desktop Office version so the desktop Office fails to display them properly, or the worse, Printers print them totally messed up. I had enough with it until MS office came to android. It is less in features like u can't save files to tablets (or phones),only to OneDrive but it's worth it. It gets the job done without any hassle or glitches, specially later when using docs on PC or printing. And, oh , unlike the article says, u can edit them unless, u r a business user. If u have an ipad, a Windows tablet (specially RT) or a Windows phone, better and better. Windows tablets ( RT or full W8 tablets less than 10") come with the full fledged Office for free. The ipad version is literally neck and neck with the full WIndows version ( but u need Office 365 account to edit even if u r not a business user, u can get one for free if u r student like me) making it the best on the app store. The Windows Phone version falls short of the full Win version and the ipad version but it's alot better and more feature rich than the iphone and the android version ( they r essentially the same). Creating docs from scratch on a Windows phone ( or any phone) is not a pleasant experience but editing is quite good and saves u when u need it, it renders files correctly, gets the job done nicely and doesn't give u headaches of the third party Office clients when viewing docs on Pc or printing. How about Kingsoft office? Tried it? I use Quick Office no problem with compatibility. QuickOffice is so much better. For commenting at PA, poweruser? Pro ver. does not exist anymore, the existing apks have ugly UI and have no updates. Its not bad but nice to know I didn't no updates are not available, but office7pro should be good? How is editing docs later on Pc ( after u have edited or created the doc on ur android device ) ? and how about printing as well ? Polaris really fails miserably in these two very important features. is it MS office that is not compatible with other apps or is it other apps not compatible with MS office. It appears that MS office tries hard to make sure no other apps are compatible with it. Not limited to android, but google office suite and keynote are also not compatible with MS office. But most android office suite, google drive office suite and keynote are compatible with each other. Hmm...As long as they release their solution to platforms other than their own, there isn't any much of a problem and no body would care. Companies like Apple and Google don't release (most of) their solutions or services to other platforms (unless there's a gold mine in doing this like in case of Google with ios). Microsoft, on other hand, releases their services to all platforms even to the minor platforms like OS X , FireFox OS, even symbian devices b4 acquiring Nokia and BB devices (BB7 or b4 and BB10). ofc their own OS's would have the upper hand in features, but at least everyone on every platform has an adequate access to their services and incompatibility if their solutions are used across the platforms is guaranteed. How is editing docs later on PC( after u have edited or created the doc on ur android device ) ? and how about printing as well ? Polaris really fails miserably in these two very important features. Office suit 7 has the most wide compatibility including supporting open office file format. However if you use certain word formating tools in desktop office save back and forth will give out of alignment issue. Nothing I can't live with just adjust them back. Pretty easy to edit docs later MS Office on PC with no issue of lost alignment. This is for edited document not a created one. I normally save at G drive and later access them via G Drive on my PC. Its very simple and it even gives you the option to save in .doc/.docx format or even in G Drive's word format, to edit. (.rtf, I think, not sure). As for printing I've never really printed any docs straight from that app as my printer isn't wireless but once saving the doc in G drive I normally give print command from PC and that setup works flawlessly for me and the doc prints perfectly too without any issues. Same for me, simply the best! later processing on PC's and printing, what about it ? third class i dont know polar office use by antartica polar bear . Trying to be ironic, but there is no polar bear foot in Antarctica, they neighbor Santa, on the Arctic Ocean surroundings (that is North Pole). But I agree with the classifications, it not the top Android Office suite, but again you will not do anything truly productive on mobile - view the files and have some small modifications, that's all. Any serious document editing will be done on PC/MAC, and this is especially true for spreadsheets. Hancom Office looks promising, but you need huge tablet screen and definitely a keyboard and mouse. This is the only serious alternative to desktop Office; the price kind of confirms it also. What about a mobile spreadsheet app which can expand grouped rows or columns on a file made with excell in desktop msoffice? Somebody help? use the free onedrive office suite. Put your phone in desktop mode for internet go to onedrive.com sign in and edit your document once you have loaded it up. Thanks for info. But an easy way related to a app like kingsoft, msoffice, quickoffice etc. (topic of article). Seriously I start to think it is not developed yet. And so for serious work we will still rely on msoffice on pc or mac. Required me to sign up for an account to use it, so not happening. Does anyone know if this supports odt/ods open office file formats? I know AndrOpenOffice does. Every Office apps in Android has compatibility issues. I can say that because I try more than a dozen of the most popular ones among them. Especially in pptx files and in math formula. QuickOffice is a little bit than others, but its word rendering is still unacceptable in many cases. Only Microsoft Office can handle them well, but to boost their Windows tablets in a stupid way, they keep it exclusive in phones.